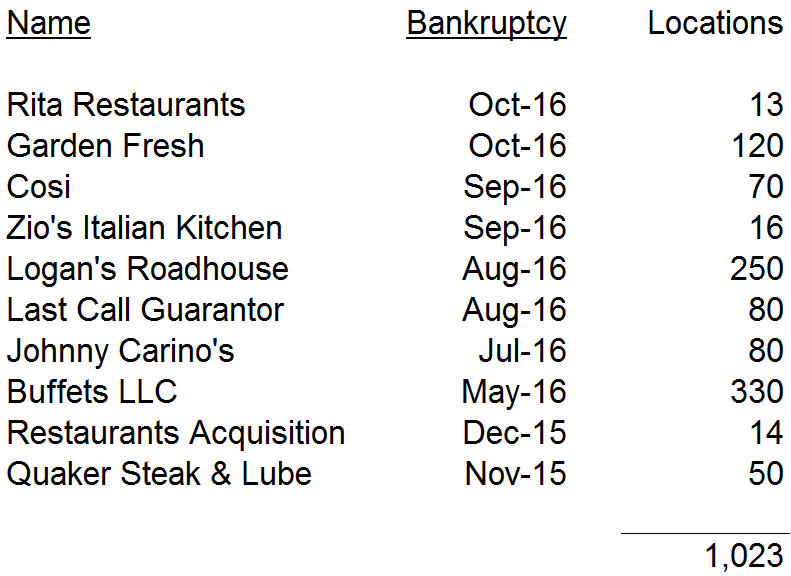 There have been 10 restaurant company bankruptcy filings since November 2015. These companies, with approximately 1,000 combined locations, showcase the difficult operating realities of restaurant chains and could be a leading indicator of a general decline in economic conditions. 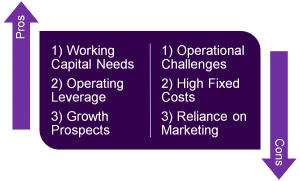 In recent years restaurant operators received increasing interest from private equity buyers as many came to appreciate the strengths of well-run restaurant operators: enviable working capital metrics (a well-run restaurant company can achieve a negative working capital position, essentially using suppliers to fund growth), strong operating leverage, and the prospect of rapid growth. 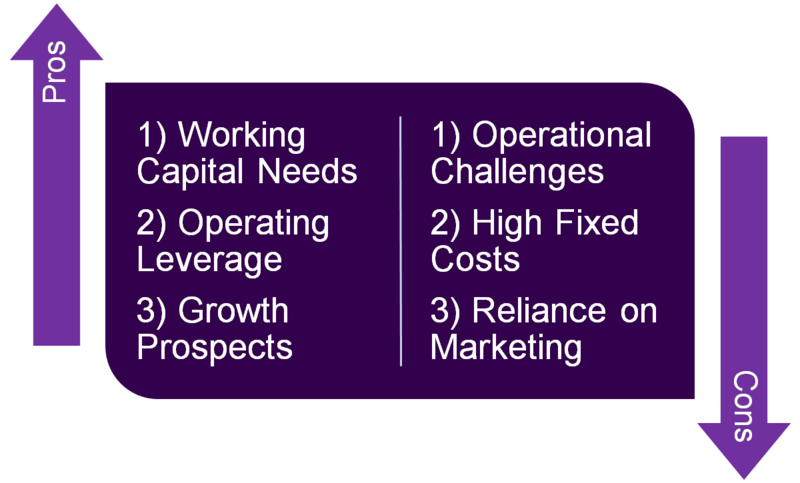 Despite these compelling traits, restaurant operators must deftly manage a number of difficult operating complexities, as they daily face the challenges of managing large (and geographically dispersed) staffs, quality control, high fixed costs, and a constant need to invest marketing dollars to drive growth. Given the cost structure of these companies, they are particularly exposed to declines in revenue, as fixed costs ensure that small declines in revenue can result in large and persistent losses. Partners. Incumbent capital providers are often fatigued by distress situations, and companies with bright post-bankruptcy prospects often find themselves with new lenders, new owners, or both. Footprint. Marginal locations are often shut, as the bankruptcy process is used to reject leases and management looks to retrench. Reporting. Distress often takes root when early warning signs are not recognized and acted on in a timely manner. A top-down focus on key performance indicators, combined with strengthened financial reporting (focusing on not only results but the causes of forecast out or underperformance) is a proven means of laying the groundwork for profitable growth. 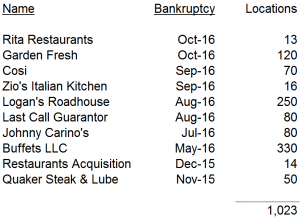 The latest news from the National Restaurant Association suggests that the recent wave of bankruptcies could be a signal of increasing challenges for the industry, as well as the broader economy at large. The August 2016 Restaurant Performance Index showed a 5.2% and 5.8% decline, respectively, in monthly measures of Same Store Sales and Customer Traffic since April 2016. In the face of these economic headwinds, the recent struggles of restaurants may be the herald of a broader economic malaise.